You know how it is with Steam, especially when you end up with a huge library of hundreds or even thousands of games: you eventually forget how you ended up with certain games. That's the case with this one Return NULL Episode 1. If I recall correctly, I managed to nab this game as a freebie from Mix-Master (if you're a regular reader of this blog, you'll know he is a generous fellow who has probably donated 1/5 of the games in my Steam library) - so thanks again Mix-Master! No wait, wrong Drebin. I mean you play an ex-cop named Jack Drebin in a dystopian future where your life goes downhill pretty fast for reasons you'll find out in the first few minutes of the game. The game boasts 14 interactive hand-drawn locations, 10 unique characters , a "unique indie European comic art style" (whatever that means), 7 tracks of music and an "innovative, real-time gunplay mechanic". Doesn't sound too bad, but is it actually any good? I love a good sci-fi adventure and Return NULL happens to be one of them. The game is set in a cyberpunk, dystopian future where climate change has wreaked havoc upon the world and caused social upheaval as a result. Crime is rampant and the only means to segregate the population is have the lower city as a prison for undesirables. Things aren't what they seem though and as usual there's a big conspiracy that needs to be uncovered. Yeah there are some cool sci-fi tunes in this game but there are a couple that can get repetitive at times. This is still a question mark for me. There are a couple of times you get to make a choice (at least that I'm aware of) - once at the beginning of the episode and once at the end of the episode. The first decision seems to make no difference on the outcome (at least in this episode) and the second decision does result in two different outcomes, but the episode ends on a cliff-hanger so I have no idea how both outcomes can be resolved until I play the second episode. The biggest criticism with the episode is that it’s only 30 minutes long. I've only clocked 50 minutes because I replayed the game to test whether you could get multiple paths or not. Thankfully, the developer has given the episode a fair price. For any point ‘n’ click adventure veterans, the puzzles in the game are incredibly easy and won’t pose much of a challenge. There are only a handful of rooms you can visit in this game so you don’t really get to explore much – although considering there aren’t many puzzles to solve either, the ratio in terms of rooms to puzzles is probably fine. Well they did say the art style was "unique" but to me that translates to a very amateurish art style where the characters don't have a consistent look. The game contains comic book style cut-scenes and there’s very little in the way of animations. 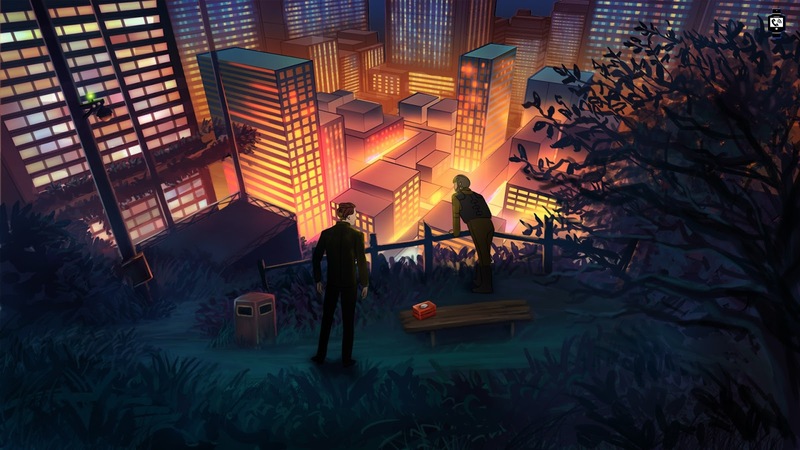 Consequently, the game has more in common with a visual novel than a traditional point ‘n’ click adventure. F12 doesn't take Steam screenshots. Episode 1 of Return NULL is good for half an hour of simple puzzles but the game has low production values and it shows. The episode does end on a cliff-hanger with two potential outcomes depending on which choice you make - so maybe you'll get to see the consequences of your choices in the next episode - but then again, maybe not as there's no evidence in the current episode that choices matter. Will I get the second episode? Well considering it's only $0.59 USD on this Steam sale, most likely. Is the game worth $1.99 USD? : Yes. Despite it being short, there is some traditional point 'n' click problem solving here.